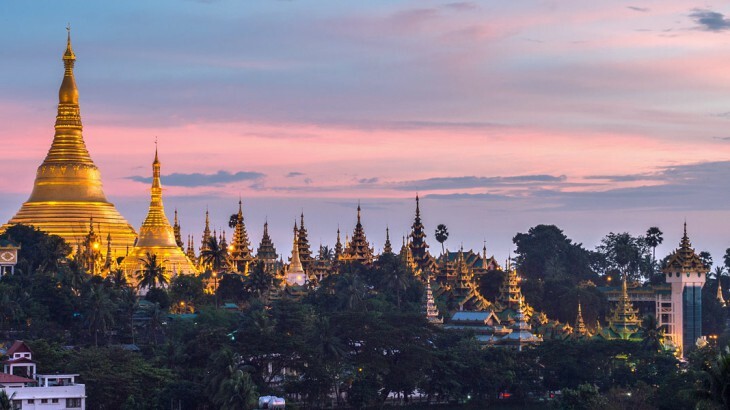 Clare Wooldridge, our Finance Executive, recently returned from a tour of Burma where she discovered this vivacious country also known as the Golden Land. Visiting a country relatively untouched by western tourists, and one that has made in onto Lonely Planet’s Best in Travel 2017, read her trip report below to inspire you on your own Burma tour. 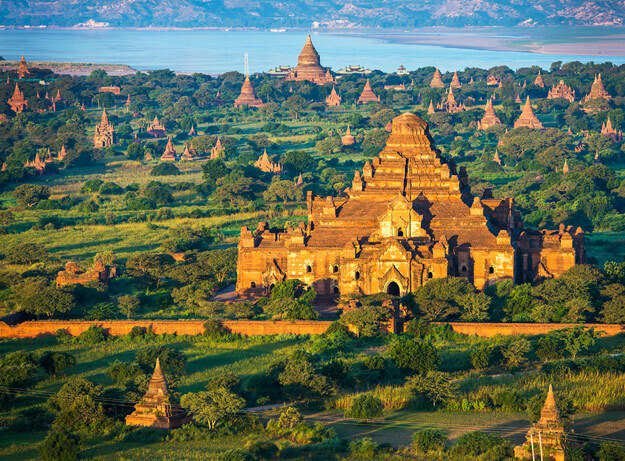 Burma is a country filled with treasures, history, culture and beauty. It is made up of no fewer than 135 recognised indigenous ethnic groups, speaking more than a hundred different languages and dialects. The land – approximately twice the size of the UK – is split into 7 states, each representing 1 of the main ethnic groups: Bamar, Shan, Kachin, Kayin, Rakhine, Chin and Mon. The main tourist sites are scattered around the country and each area is reached by either an internal flight or by the Irrawaddy River. A Wendy Wu Tour to Burma is fully inclusive, escorted by an expert guide and one not to be missed! 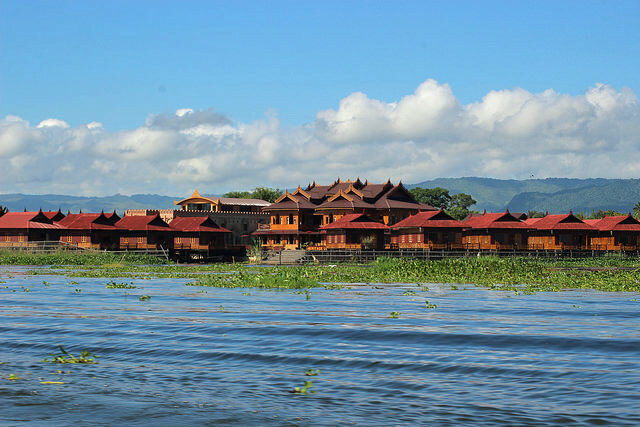 A stunning freshwater lake famous for its floating villages, Inle Lake should feature in any Burma itinerary. We were met by our guide after breakfast to begin our full day of touring the lake by engine-driven dragon boat. First, we travelled to the Inle Lake market, passing some of the stilted “Intha” fishermen and many other small boats carrying their loads to and from the market on the way. We walked around the market taking in the sights and smells. Everything sold here is necessary for daily life; we even saw an area for hairdressers! We tried a few local delicacies including a stick of bamboo, which had each layer stuffed with sticky rice, as well as some custard apples. We had our first visit to a Burmese temple here in the market: the first of many golden Buddhas. We had to remove our shoes and socks, and our guide provided a wet towel for us to clean our feet on exiting the temple. This was the same throughout our stay in Burma. The rest of the day was spent visiting local craftsmen and women who live on the lake, starting with cheroot makers, boat builders and an iron smithy where local knives were made using traditional methods. We also visited Cat Island, where a group of very pampered Burmese Cats live a life of well-deserved luxury! We then flew to the capital city, Rangoon (also known as Yangon). 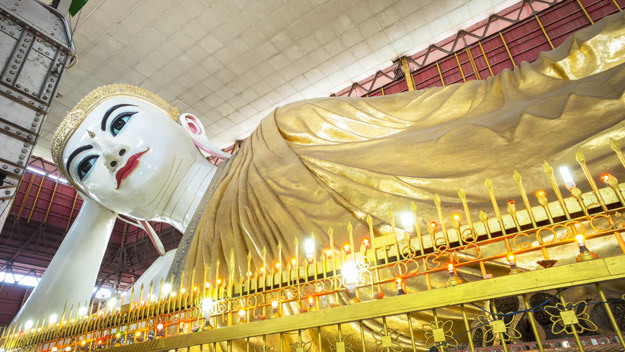 Our first stop on our Burma touring schedule was a visit to the huge reclining Buddha at Kyauk Htat Gyi Pagoda: an impressive 70 metres long. We followed this with a visit to one of Rangoon’s lakes: Kandawgyi Lake, which is said to come alive in the evening as the place for young locals to socialise. The edge of the lake housed a huge ceremonial barge called the Karaweik Palace, which in the evening hosts a buffet style restaurant and a nightly show of traditional music, dance and puppetry! Our tour of the downtown area of Rangoon covered several blocks of stunning colonial buildings, but more fascinatingly the pavements were squashed with traders selling anything from food to shirts! 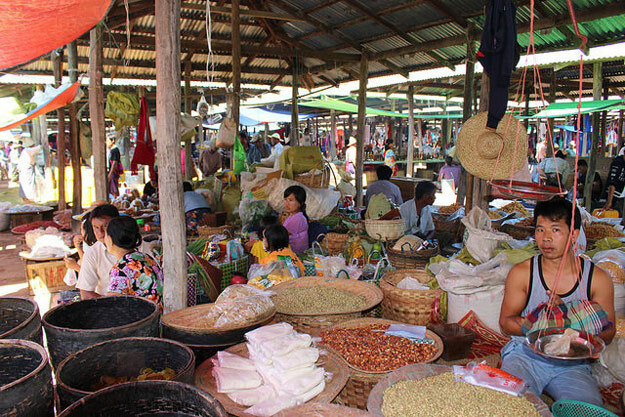 Most local people do not have breakfast at home in Burma but choose to stop on the street for a drink and a local dish, such as noodle soup or curry. We also toured the country’s Independence Memorial and a great local market, stuffed with jewels, local garments, souvenirs and general household items. 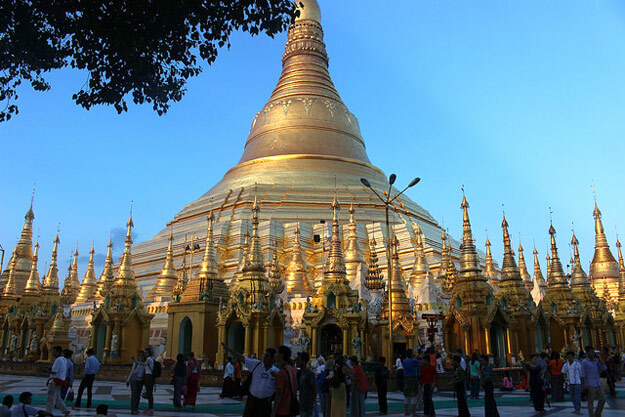 Our Rangoon day of touring concluded with a sunset visit to the impressive Shwedagon Pagoda. We cannot put in to words the atmosphere we encountered! We were there at the same time as the Full Moon festival, which celebrates the end of fasting. The golden temple was awash with monks, tourists and local families gathering for picnics and prayers. As the sun set, the lighting up ceremony of Shwedagon Pagoda began, where the 60 tonnes of gold used in the construction of the pagoda was bathed in spectacular light. 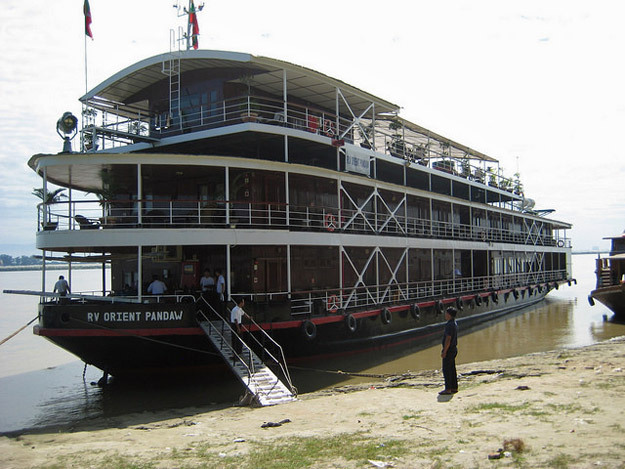 We flew to Mandalay to transfer to our Pandaw cruise boat for our Irrawaddy River Cruise. We received a welcome drink and a cold towel on arrival – much appreciated in the Burmese humidity! Our air-conditioned cabin was cosy but very comfortable. There was an option of twin or double beds, plus there was plenty of storage space. There was an in-room safe, an en-suite shower with toiletries from L’Occitaine and regularly replaced bottled water. 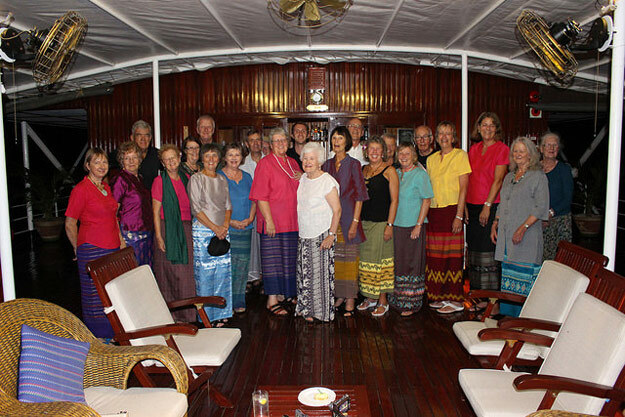 There were 25 guests on board our cruise with 26 crew – perfect! The boat takes a maximum of 60 guests. Local drinks were also all included: everything from fruit juice, tea and coffee to local beer and spirits. Each day’s itinerary was laid out in the cabin, along with a weather forecast. In the afternoon, we transferred back to Mandalay to explore. This was Burma’s last royal capital city. First we visited a factory detailing how gold leaf was produced. 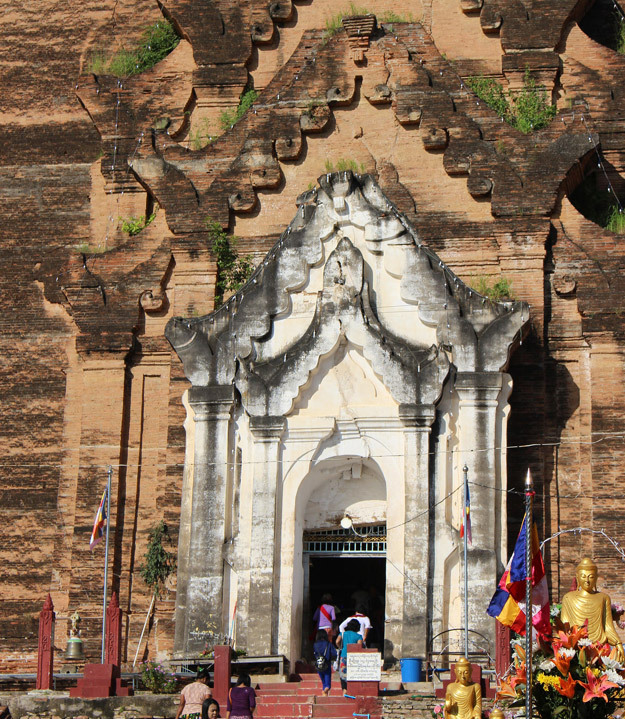 In Burma, families save to purchase gold leaf, which they then adorn onto the temples. Our next stop was the Golden Palace monastery, also known as Shwenandaw Monastery. Its teak exterior was stunning! 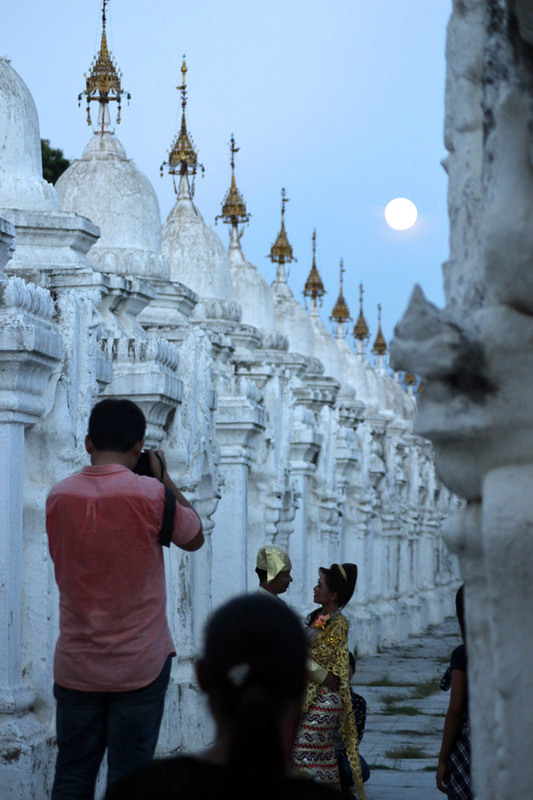 We finished our afternoon of touring at the Mahamuni Pagoda, and with evening drawing in, we were able to get a glimpse of a wedding couple having their photos taken under a wondrous full moon! We returned to our boat to continue our cruise to our next destination, having a wonderful dinner on board. Waking up to the sights of the town of Mingun, we departed on a walking tour to see its sights. The fourth Burmese King of the last dynasty tried to build the world’s biggest stupa called the Mingun Pahtodawgyi, but it remained unfinished as the King fell sick before its completion. Made of sand-coloured brick, it partially collapsed after an earthquake in 1838. We then visited the Burmese equivalent of the Taj Mahal, called the Myatheindan Pagoda. 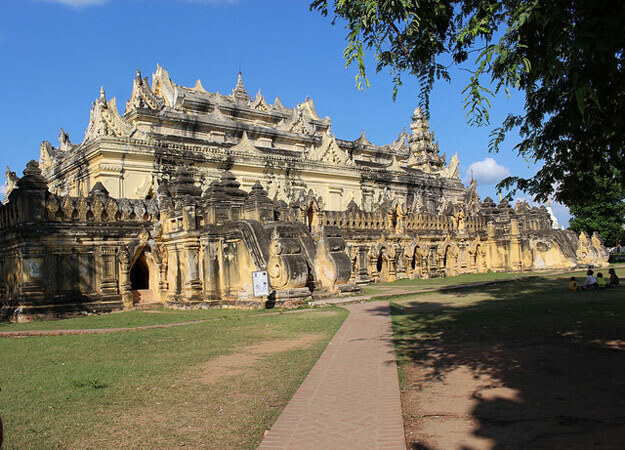 It was built by the crown prince for his deceased queen and the design incorporated 7 mountain ranges & 7 great rivers, decorated with Burmese cosmology signs. We also visited Mingun’s famous bell, weighing in at 90 tons. After dinner on board, we watched as an impressive display of fireworks and paper lanterns were let off from the shore to celebrate the Full Moon festival. The next day, we set off on foot to a village situated on the river. A large crowd gathered to see us arrive and were fascinated by our presence! We were able to talk to the local villagers with the help of our guide. 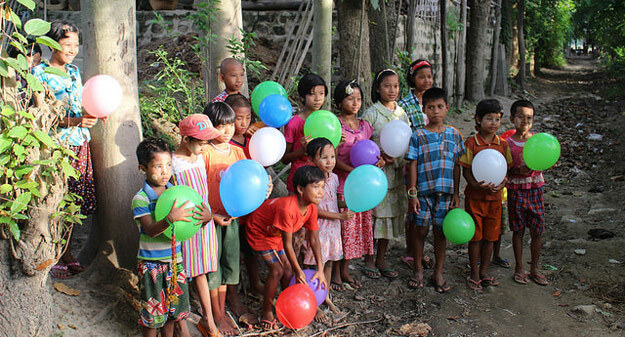 We also helped to distribute balloons for the children, who had fun blowing them up and playing. It was great to see the rural lives of the locals. In the evening, we watched a film about the founding of the Pandaw Cruise company. Our next mooring was in Amarapura, where we travelled by horse and cart to another ancient capital, Ava (or Inwa). We visited the Bagaya Monastery – where royals were educated – and also the deserted Palace of Ava, featuring a watchtower synonymous with 19th century Burmese architecture. 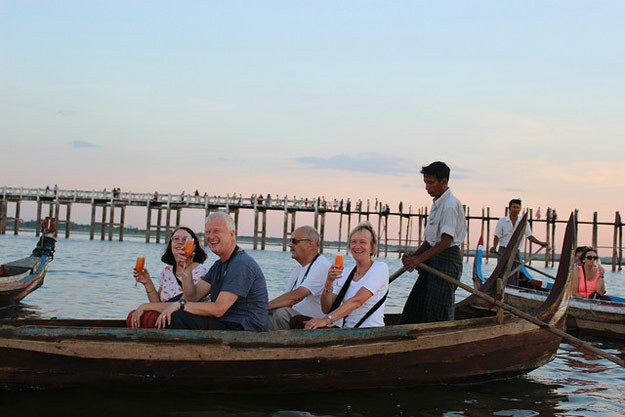 The highlight of our day was a boat ride under the famous U Bein bridge at sunset. The longest teak bridge in the world at 1.2km, and the oldest, it was a stunning sight. The Pandaw crew then arrived in their own boat and provided us with delicious cocktails to drink as the sun set: perfect! The next morning we explored Yindabo village, famous for its pottery. The village is also famous as the spot where the treaty to end the Anglo Burmese war was signed. In the afternoon, we had a guided tour of our cruise ship, including the engine room, galley, laundry, crew rooms and bridge. We also watched a presentation on the history of Burma, including its current political situation. This was followed by a fun language class! We arrived in Bagan with great excitement. One of the world’s greatest archaeological sites, over 2000 pagodas and temples still stand on the site! Our first stop was the famous Ananda, an 11th century temple with a golden stupa. We got to discover many of the different pagodas in the Bagan plains and before we knew it, sunset was upon us. A pagoda was selected for us to view the sunset from, so we climbed a narrow staircase onto a large platform for optimum viewing. It was stunning! 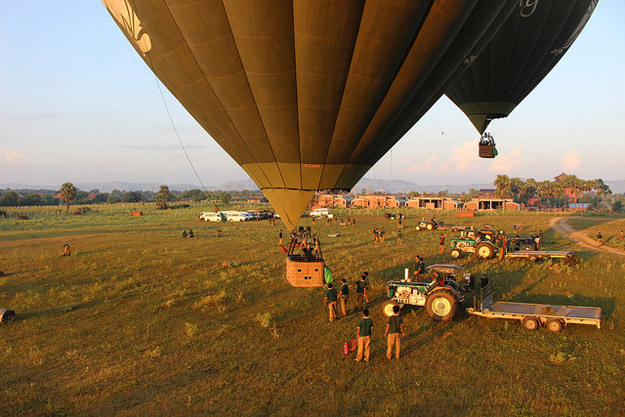 The next morning, we were collected at 5am for our privately organised hot air balloon flight over Bagan, which we booked in the UK via Oriental Ballooning. Collected by minibus and transferred to the launch site, we waited in excitement for our launch whilst having breakfast. We flew with pilot Matt and six other people for 1 hour 20 minutes. There was a light wind so we didn’t get to go far over the temples, but the stunning views across Old and New Bagan were definitely worth it. Something to certainly book if you’re planning a holiday to Bagan. 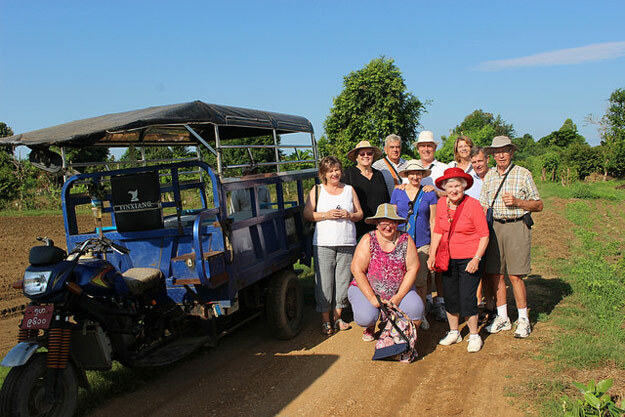 Once we landed, we were transferred by minibus to meet up with our guide and group who had already started the day’s sightseeing around Bagan, visiting many more wonderful temples. After a full day of exploring, we returned to our cruise ship for the farewell party. The Captain sang and played guitar whilst two of the crew dressed up as a local man and woman, where they performed a wedding dance! We all joined in as we said our goodbyes to the crew who had so expertly looked after us during our time. All in all, it was a fantastic trip. 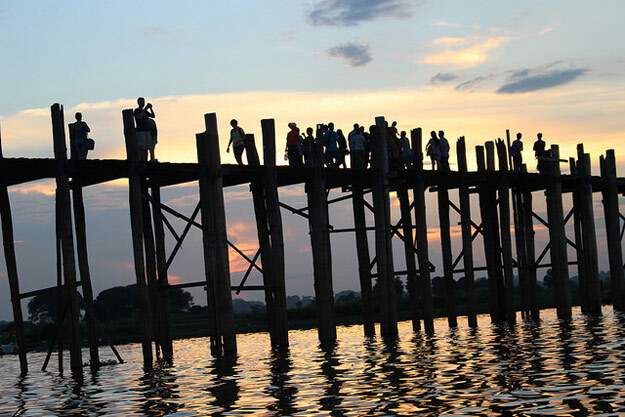 A visit to Burma with Wendy Wu Tours should be on everyone’s travel bucket list! Make your own memories of enigmatic Burma when you book an escorted Burma tour with Wendy Wu Tours, the UK’s leading Asia Experts. 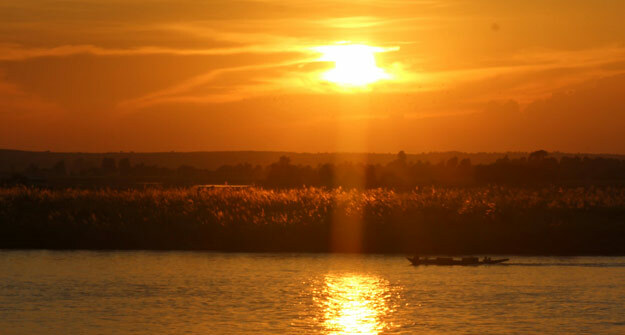 Choose from group or private itineraries, and tours with anything from 2 nights to 7 to 10 nights on the Irrawaddy River. Led expertly by our guides, you won’t book a better holiday. Burma fam, sightseeing, travel, unesco heritage site, views. permalink.